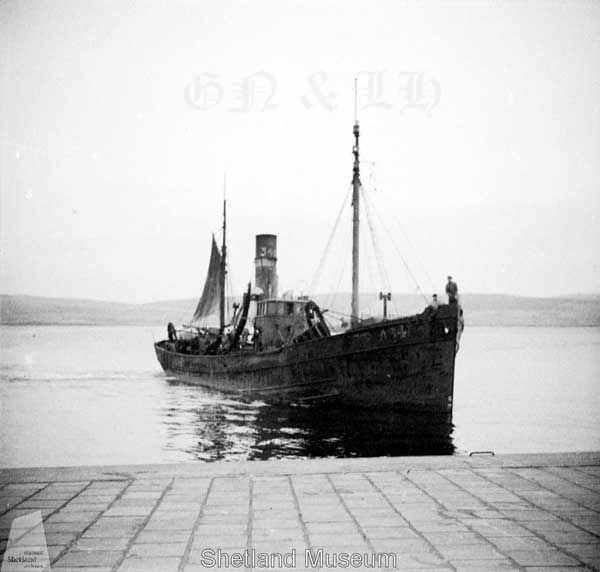 08.1914 Requisitioned and converted to minesweeper (Ad No.94) based on the Tyne. 25.08.1917 Sir John Hannel Irvin K.B.E. manager. 02.1920 Owned by Jack Breach Ltd, Lowestoft (John V. Breach manager). 1923 Owned by Thomas L. Devlin & Sons, Granton Edinburgh (Robert D. Devlin & Thomas L. Devlin Jnr owner/managers)(£3000). 09.05.1923 Registered at Granton GN 96. 11.11.1926 After the death of Robert D. Devlin; Thomas L. Devlin Jnr owner/manager. 1935 Owned by John Walker, Aberdeen (owner/manager). 12.03.1941 Owned by George Robb & Sons Ltd, Aberdeen (George Robb manager). 11.05.1942 Damaged by mine in position (59 39'N : 09 25'W) repaired and returned to service. 03.1960 Sold as scrap to BISCO (British Iron & Steel Co) for £2237. 30.03.1960 Arrived at Charlestown Fife. 13.06.1960 Scrapped by Shipbreaking Industries Ltd at Charlestown Fife.